Day 198: Wine – Texas Style . . . Weekends do tend to fly by . . . especially weekends where travel from one place to another and back again is involved. Driving eats up chunks of time and driving in Texas is about large chunks! Being centrally-located in San Marcos really helps a lot. We’re 3 1/2 – 4 hours from most places . . . the Coast, D/FW, Houston, etc. As we mentioned last night, the wedding of our friends in Aransas Pass, meant a drive to the coast yesterday and a return trip today . . . with Daughter #1 in tow, and she needed to head back to school today after her spring break trip. What’s it all mean? Driving. Lots of driving! The last time we bought a car (used), the dealer–whom we’ve purchased from previously–commented that we drive a lot. This comment was based on odometers of cars traded in over the years. Yep . . . we drive a lot. We like to be able to get in the Jeep and slide the top down to soak up some of that warm Texas sun and head north, south, east or west. We’ve been driving a lot for the 30+ years we’ve been together. From 4,200 mile round trips to spur of the moment road trips to visit family, there is something magical about putting some gas in the tank and hitting the road. Unfortunately, as gas prices have risen, the number of trips and length of trips has diminished significantly. However, the call of the open road is alive and well and this weekend was one of those “just gotta go” moments – kinda like the Southwest Airlines commercial – – – “Wanna Get Away?”. 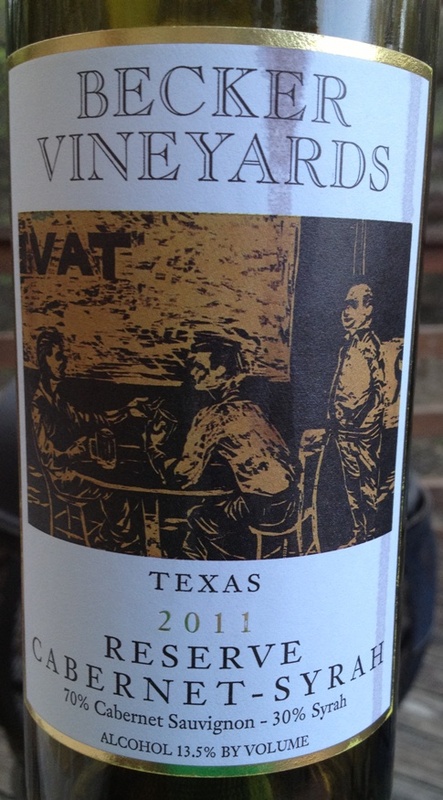 It seems appropriate – since we’re talking about driving in Texas – that we zero in on a Texas wine that has gained some significant notoriety . . . tonight we enjoyed a 2011 Becker Vineyards Reserve Cabernet-Syrah. The first thing about this wine is that it tastes really good! Yep, we know it’s hard for us to even type that, but this wine has character, body, beautiful color and best of all a great taste . . . on the front palate and a terrific finish. Made of 70% Cabernet and 30% Syrah, this wine really has rich, wonderful deep, dark fruit, with hints of tobacco and caramel and aged in French and American oak barrels. Clearly, the Syrah grapes, gives the wine a nice berry flavor. For the $22 price, we’d suggest some other wines from Australia and Washington that may be just as good, but priced less; however, as Texas wines go, this one is clearly a winner. And, in fairness to Becker, at its’ existing price point, this wine outshines some higher priced wines we’ve tasted previously. Like most wines, it comes down to taste and preference. As for our experiences at Becker — another driving trip — we’ll save that for another day; however, when you visit this place, you’ll love the tasting room, the grounds are superb and who knows, you may end up getting your picture taken and published in a book about wineries without your permission! The area where Becker is located has been populated by an ever growing number of wineries . . . some of these make wine from grapes grown on their property and some make their wine from grapes sourced in west Texas . . . many of them are opting for fruit purchased from California or other parts and still others are simply buying the juice and making wine without all of the “mess”!! It’s still an amazing process for us to watch! We hope that you’ve had a good weekend. With temperatures in the upper 70’s and low 80’s, it’s been one of the nicer spring break weeks in recent memory. For us, it ended with a nice wine with a good taste and our hope that you enjoy your favorite wines responsibly and remember to recycle whenever possible. Categories: Uncategorized | Tags: Becker Vineyards, cabernet Sauvignon, Cabernet-Syrah, Driving, Fredericksburg, Jeep, Road Trip, Southwest Airlines | Permalink.